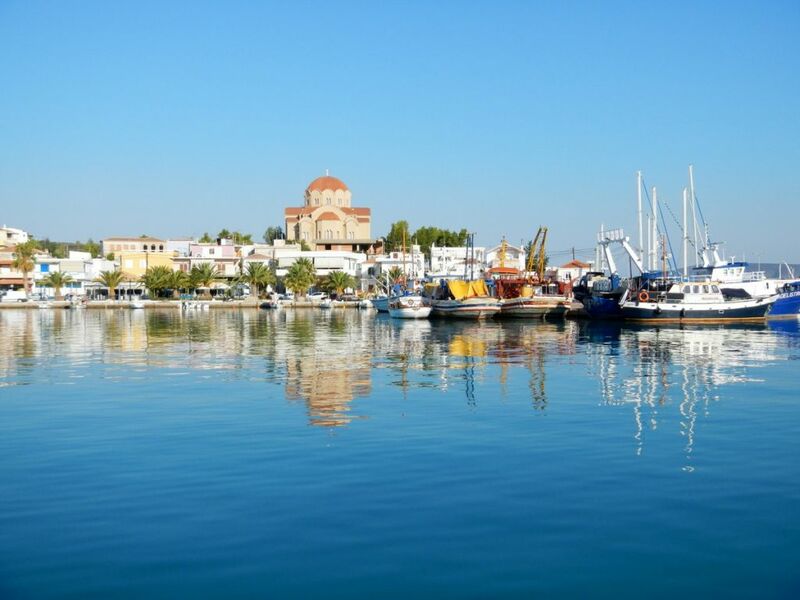 Dominating by a lovely (pretty big) church at the entrance to the town’s bay, this fishing village with its fishing trawlers and little fishing boats fringing the town’s port was one of the pleasant surprises on our journey around the coast of Peloponnese. A nice protected bay made Kilda a great choice to overnight. As we came in, the caves on the hill opposite the town got our explorers on board going and they soon found a friendly dinghy dock at the start of the path and a well set out (level) path way all the way to the entrance of the cave. With well described history notes and a massive cave opening up in front of them, it was a well worth visit! Cave Frachthi and the important archaeological findings in the area have given the region great fame. During 1967 – 1983 excavations found human skeletons, animals, tools and ceramic object of the Neolithic period. The cave was inhabited approximately 30 000 years ago and was continuously inhabited until 3000 BC. It was in this Cave that the oldest whole human skeleton was discovered in Greece, which was buried during the 8th millennium B.C. Although Kilada’s is mainly a fishing village, it is also known for its two shipyards, manufacturing wooden fishing boats as well boat maintenance. The laid back, friendly vibe of this small village was a very pleasant surprise indeed! 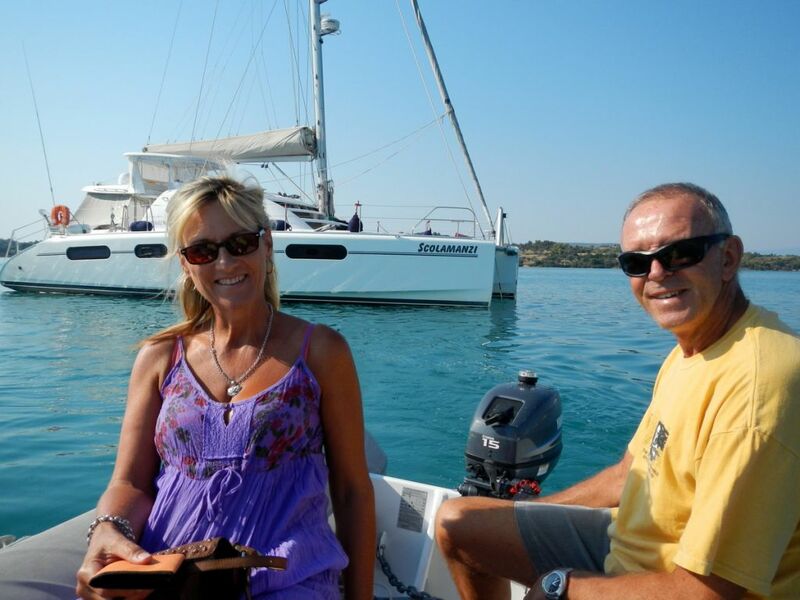 This is then also as far west we will get going around the coast of Peloponnese. We had to turn back to Poros to drop Annemie and Lientjie off. They planned to take the bus to Athens from the nearby town of Kranidi. Our last night together was spent at a lovely Italian restaurant, with a magic view (from the second storey) across the bay, having pizzas, topped off with a great Chianti Classico wine – my favourite Italian wine! 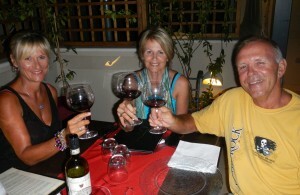 We have been doing the traditional Greek food every day of the 2 weeks together … Ristorante Pizza Italia gave us just a nice break in the pattern and will be remembered as our last fun evening in Greece having Italian food and wine out of the most beautiful long stemmed red-wine glasses!! Good times means good wine and great company! They left the next day with a taxi to the next town, Kranidi, from where the busses leave for Athens. The price for the taxi trip was determined before we left as €12 one way. I went along to see them off and asked the taxi to stop for 5 min to pay my Internet data account at the Cosmote shop. He was noticeably agitated by my request, but we left 5 minutes later for Poros. On our arrival, he signalled to me (suddenly he could not speak English any more … where earlier this morning he was pretty fluent when snatching the deal!) that all in all it cost €50! I was trying to tell him it does not make sense to have a one way fee of 12 Euro and return fee of 50 Euro!? I am happy to pay him another 5 for waiting, but he stuck to his guns. I gave him the money and made sure he understands, that he was ripping me off, and is dishonest and will not do good business this way. My moral lecture must have struck the right cores or he might have thought I have cast a spell on him, because he came running after me to give me 25 Euro back without an explanation or an apology! Be careful for getting tricked into something like this! !Make sure you make a deal in full before leaving! The same goes with Greek waiters! They can sometimes pile on extra food and made you understand it is “ from the Mama in the kitchen for you to try” and €40 later you will have little left to defend your ase! Be aware of the tricks! They tend to understand everything until you want to query the price – then “No Inglish” is all they know! Luckily those incidences were by far in the minority but does leave a bitter taste behind.